* Although, we’re pretty sure he was joking. 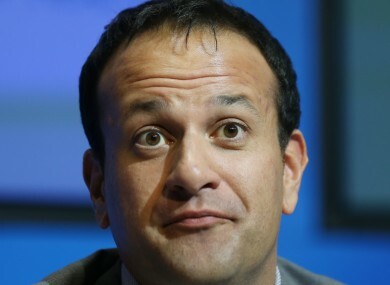 THE POSSIBLE APPOINTMENT of a new Minister of State with responsibility for drugs has caused some confusion today with Leo Varadkar admitting earlier it was “news to me”. The Health Minister was speaking after the Taoiseach confirmed in the Dáil yesterday that he would give consideration to appointing a minister with direct responsibility for the National Drugs Strategy. Enda Kenny told Labour TD Pat Rabbitte that he would give consideration to allocating responsibility for the drugs strategy to an existing Minister of State. This evening, Rabbitte said that it was very difficult for any minister “even Leo Varadkar” to take on the responsibilities for all of the Department of Health. Earlier, Varadkar pointed to there having been no further cutbacks to drugs task forces, the budget for drug treatment being increased by €2 million, a new life-saving drug to treat overdoses being trialled and work having begun on the new national drug strategy. He said that appointments of junior ministers would be “entirely a matter for the Taoiseach” but said that any appointment of a minister specifically for drugs should be done cross-departments as “drugs is about more than health”. Rabbitte had raised the issue during the Dáil’s Order of Business yesterday. He later said in a statement that “it is vital that the National Drugs Strategy is given political leadership”. “It is not practical to expect any Minister for Health to be able to sufficiently concentrate on its implementation,” the former minister said. Email “Pat Rabbitte: 'Maybe Leo thinks he could run the entire cabinet without anybody'*”. Feedback on “Pat Rabbitte: 'Maybe Leo thinks he could run the entire cabinet without anybody'*”.